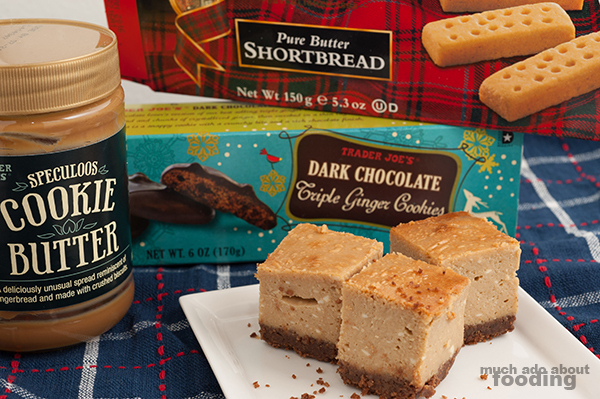 When cookie butter was first released from Trader Joe's, it seemed to throw everyone into a frenzy. This delicious seasonal favorite is based on the speculoos cookie, a holiday treat that has all the makings of a gingerbread cookie but with even more oomph to it (how does one explain it?). Pureed with little crushed bits of cookie, the cookie butter was an instant hit that could be used on top of multiple things...but what if you cooked with it? My friend gave me a whole slew of seasonal treats from Trader Joe's one day, and I decided I ought to make something with everything combined. I know this limits those of you who want to make the recipe but it's worth it when the time comes. 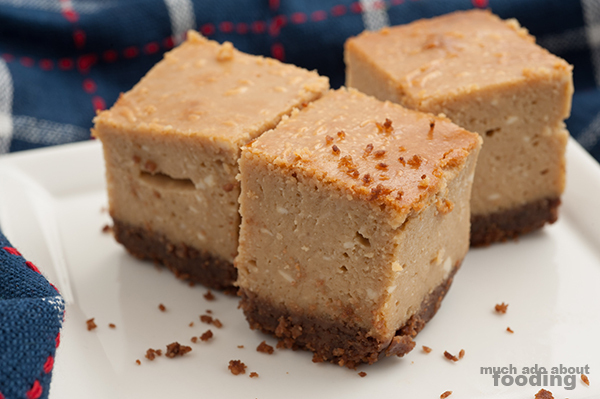 Using shortbread and a chocolate ginger cookie to make the crust, I topped it with cookie butter cheesecake which took on a firmer consistency than regular cheesecake (blame the dough already present in the cookie butter) but was still tasty as ever. Don't worry - the recipe is not difficult at all. Maybe you should treat yourself and your loved ones in the future by making these adorable bites full of is-this-even-real?! Preheat oven to 375°F. Melt butter in a small bowl. In a food processor, crumble shortbread and ginger cookies. Line an 8x8 pan with foil, creating an overhang to fold over the edges (makes removal easier later). Pour crumbled cookies into bottom; pour over melted butter. The chocolate will melt so mix in flour to bring back a harder consistency. If you require more than two tablespoons, add as needed. Bake for 10 minutes to harden. Let cool for 10 minutes after removing from oven. Puree together all ingredients for the cheesecake (cream cheese, cookie butter, honey, and eggs). Once the crust has cooled a bit, pour cheesecake filling over it and place in oven. Bake for 30-35 minutes. The middle may still be a little jiggly but that's okay! Let cool thoroughly before placing into the refrigerator. It's better chilled. 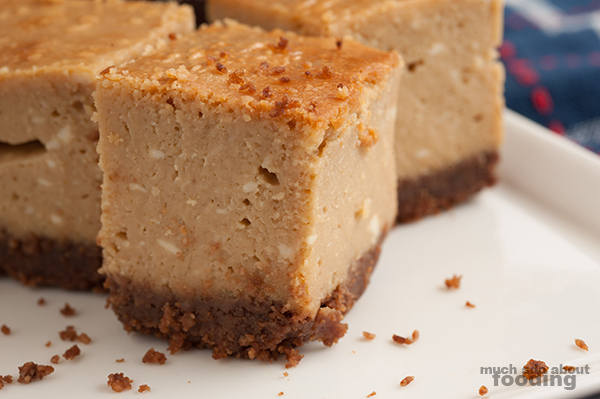 Slice into squares and serve!